Your home lovingly protects you and your family, so why would you not do the same for it? You may clean once or twice a week and decorate it with beautiful accents, but many people with hardwood floors actually end up doing more harm than good when they use certain cleaners on those delicate surfaces. Your hardwood floors are easily susceptible to dents, scratches, warping, peeling, stripping, and even water damage that many cleaning products can cause. Harsh chemicals and even fragrances have the power to wear down your wood floor’s natural shine and value. Vinegar and Ammonia: Cleaning products that have a base of vinegar or ammonia eat away at the dirt on your floor – and also the floor’s finish itself. Overtime, the acid will wear down your hardwood, leaving you with splotchy patches that are difficult to revive. Oil Soap: Cleaners with an oil component are great at making your floor appear shiny, but they often just trap dust and dirt on top of the varnish, leaving your flooring to fade overtime. Excess Water: It may seem like a good idea to grab a mop and go to town on your hardwood floors with a bucket of water, but if you use too much water, the liquid will start to absorb into the wood, causing it to expand, and potentially crack at the seams. This creates a devastating mess that can never be repaired – only replaced. 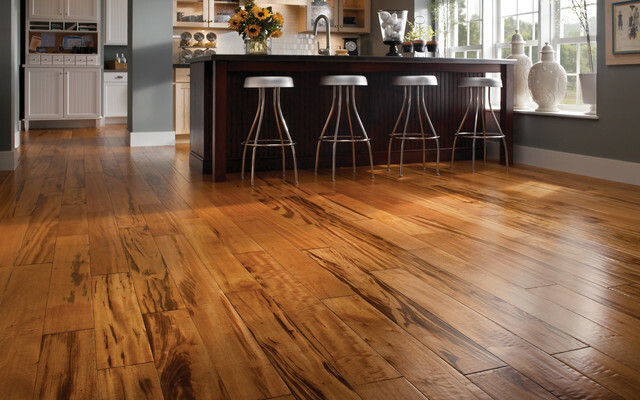 Just because some products harm hardwood does not mean that you should skip cleaning your floors altogether. Instead of using those certain cleaning products that can damage your flooring, have a professional like Zerorez tend to your floors, or do it yourself with a few drops of lemon juice and warm water on a soft cloth instead. This natural mixture will keep your floors sanitized, sparkling, and living up to their initial potential.